Nose: Peat, salty beach water, bran flakes, and mixed berry sorbet. Also a hint of a wine glass that has been left overnight. Palate: Quite maritime for an Octomore; salty and hints of iodine. Quite smoky, and spicy. Burnt ANZAC biscuits and mixed berry jam. Slight traces of vanilla. Mouthfeel: Reasonably thick and slightly oily, with a bit of warmth. Finish: Decent length on the finish. Dry and spicy, with lots of dried berries – strawberries, raspberries, red currant. Also a slight hint of chocolate and hazelnuts. 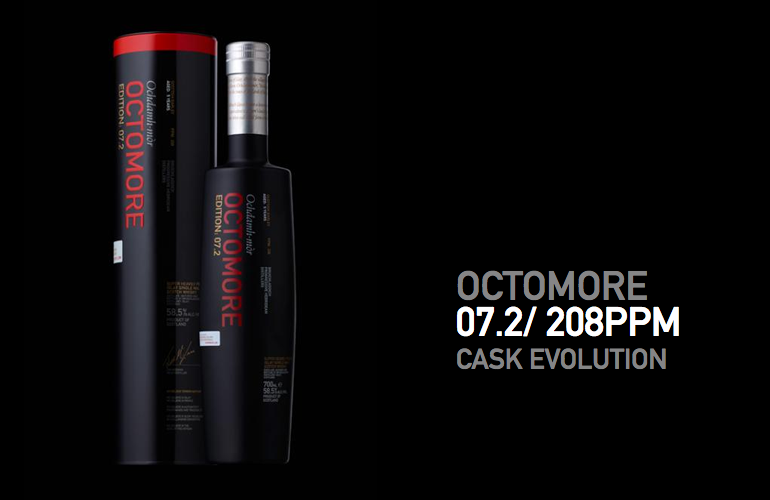 Octomore 7.2 is a 5 year old single malt from Bruichladdich on Islay that was peated to 208ppm, and bottled at 58.5%ABV with no colouring, and no chill-filtration. The x.2 releases of Octomore are all wine cask finished whiskies, and the 7.2 was finished in Syrah casks from the Northern Rhone Valley. Both the 6.2, and 7.2 have been Travel-Retail Exclusive releases, which I expect will be the case for x.2 releases going forward. I have heard different people – all generally fans of Bruichladdich’s Octomore series – refer to Octomore 7.2 both as the second coming of the 2.2 (considered by many, me included, to be the best Octomore ever released), or as an unmitigated disaster of a whisky. Such is whisky. Personally I quite like the 7.2, but it pales in comparison to the next most recent x.2 – the 6.2, which was probably the equal second best Octomore that I have ever had. Also, unfortunately for the 7.2, in the comparison department is the fact that the 7.1 is one of the best x.1 releases, and the 7.3 is just stunningly superb. Finishing whisky in wine casks is a tough task to get right, and a wine as rich and bold as syrah certainly wouldn’t make such a task any easier. When done correctly you end up with some of the greatest whiskies than mankind has ever created. You can also however end up with whisky that is completely at the other end of the scale. I wouldn’t say that Bruichladdich got this one perfect, but they weren’t far off – I’d personally rate this one better than the 4.2, but behind the 6.2 and 2.2 releases. For me, this release hasn’t quite got all the elements of the whisky in harmony yet – it probably needed either a bit less peating (yes, I did just say that – people who know me will now have undoubtedly fallen off their chairs in shock), or more likely a bit of extra time in the cask. All up, this is a good whisky – not brilliant, but my bottle certainly won’t have any issue getting drunk. It’s certainly one of the better travel-retail exclusives that’s out at the moment. If you’re going through duty-free, and can grab a bottle, I’d recommend coming away with one.